Vietnam's financial sector substantially contributed to the bright picture of the Vietnamese economy in 2017. On the occasion of the Lunar New Year 2018, the Year of the Dog, the Vietnam Business Forum has an interview with Mr Dinh Tien Dung, Minister of Finance. Le Hien reports. Budget revenue was estimated at VND1,283.2 trillion in 2017, VND71 trillion more than the plan. How do you feel about this impressive figure? Indeed, it was a very good year for the financial sector’s revenue and expenditure regulations. In 2017, we felt very concerned when the GDP growth was just 5.15 per cent and 6.28 per cent in the first and second quarters, respectively, lower than the GDP growth in 2016. And, the target of a 6.7 per cent GDP growth in the year might be an impossible task. However, the Government and the Prime Minister remained steadfast to this goal. With many solutions, the second half of the year saw very impressive results, with the third quarter and fourth quarter GDP expanding 7.46 per cent and 7.65 per cent. Vietnam's economy had a spectacular ascent. Budget collection was firmly focused right from the beginning of the year. The Ministry of Finance instructed tax and customs authorities to implement tax laws and State budget collection tasks; exploit income sources; fight against tax loss, transfer pricing, smuggling, trade fraud and tax evasion; drastically handle tax in arrears; and strengthen tax inspection and examination. As of December 31, 2017, State budget revenue was estimated at VND1,283.2 trillion, exceeding the initial target by VND71 trillion, or 5.9 per cent and the estimation of the National Assembly by VND43.7 trillion. It accounted for 25.6 per cent of gross domestic product (GDP), of which taxes and fees made up 21 per cent. The image of all employees struggling to press on budget collections in the last days of 2017 when the New Year day fell on weekend left deep impression on me about great efforts of our workers for the above wonderful figure. Another highlight in the past fiscal year was that financial market restructuring also brought a great source of revenue for the State Budget. How do you assess this work? It is simple that we must take something in before spending it. The first highlight is the stock market - an important fundraising channel for the economy. The Ministry of Finance actively deployed development solutions and brought the derivatives market into operation from August 2017. 2017 also witnessed the boom of the stock market when its primary gauge, VN-Index, reached 1,000 points for the first time in many years. The stock market capitalisation was about 70 per cent of gross domestic product (GDP) (compared to 34.5 per cent in 2015 and 44 per cent in 2016), an increase of 80.5 per cent from the end of 2016, thus fulfilling the target set to be achieved in 2020. For the insurance market, total premium income was estimated at VND105.6 trillion in 2017, up 21.2 per cent over 2016. Total assets of the sector reached VND302.9 trillion, up 23.4 per cent on year. As much as VND247.8 trillion was invested into the economy. Insurance coverage payment was about VND29.4 trillion, up 14.9 per cent. The next impression is SOE restructuring. As of December 20, 2017, as many as 47 State-owned enterprises (SOEs) had been approved for equitisation, aiming to take proceeds of nearly VND336 trillion. In 2017, SOEs divested VND2.27 trillion and earned US$4 trillion from this activity. SCIC divested from 40 enterprises to earn proceeds of VND21.6 trillion. Remarkably, the successful sale of 53.59 per cent of State equity in Sabeco brought in nearly VND110 trillion to the State budget. Foreign investors and strong investment funds have been paying attention to the SOE restructuring market, showing the attractiveness and potential of this market and indicating a more successful effort in 2018. No matter how successful budget revenue collection is, it will be a failure if it is not managed tightly enough. Given very tight State budget, how do you comment on this issue? In the past years, balancing budget revenues and expenditures has been a very heavy and pressing task of the Ministry of Finance, especially with the pressures of foreign debt repayment. Meanwhile, recurrent expenditures for the administrative apparatus still account for a high proportion and spending on development investment and disaster relief is also big. If there is no plan for action and control, it will be very hard to balance the budget. The Ministry of Finance issued documents guiding the ministries, branches and localities to implement State budget expenditure estimates in 2017, actively and economically deal with borrowing right from the stage of estimate-based budget allocation and implementation, restrict requests for budget supplement and advances for next period. The ministry has closely regulated, administered and used reserves at all levels. In previous years, if foreign debts accounted for 60 per cent and domestic debts made up for 40 per cent, the balance reversed in 2017 according to the direction of the Government. 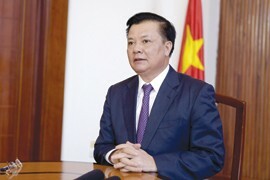 The Ministry of Finance advised the Government on active treatment and management of budget affairs to ensure important and urgent tasks; spent over VND4.2 trillion from central budget reserves to address consequences of storms and floods and provide seedlings and livestock for farmers to restore production after disasters; proposed delivering 127,300 tonnes of rice from national reserves for hunger relief for disadvantage people and pupils; and timely paid damages for maritime environmental incident caused and paid by Formosa. As of December 31, 2017, recurrent expenditure tasks basically met estimations and timely financed State-funded bodies. State-funded development investment spending accounted for 75.9 per cent of the estimation and Government bond proceeds reached about 23.5 per cent of the estimation, compared to 77 per cent and 45.3 per cent in 2016, respectively. As a result, the State budget deficit in 2017 was managed within the limit approved by the National Assembly (VND174.3 trillion, equivalent to 3.48 per cent of GDP). Based on collection results and reduced expenditures on really unnecessary, delayed and misused tasks, the balance of central and local budgets was basically ensured. Pressures on budget revenues will remain in 2018 when many bilateral and multilateral trade agreements to which Vietnam is a signatory take effect, resulting in reductions in tariff reductions. Would you be kind enough to tell action plans to collect and nurture budget income sources? Financial and budgetary policies and regimes are amended, supplemented and promulgated in line with actual situations and international integration commitments. According to Resolution 19, tax and customs reforms will be particularly focused to reach the ASEAN+4 level by 2020 and to create favourable conditions for trade and investment of enterprises. Currently, the Ministry of Finance has reviewed 325 administrative procedures; simplified 38 administrative procedures and abolished four inappropriate administrative procedures. According to the assessment of the business community, tax and customs reforms have helped significantly reduce their costs and time, and improved the service attitude of civil servants. In 2018, the ministry has adopted nine groups of solutions with 29 specific solutions to carry out fiscal and budgetary tasks in 2018. This year, the ministry will focus on expanding the basis of tariff rates in combination with adjusting tax rates according to the appropriate roadmap. The robust growth of Industry 4.0 has appeared in many fields such as global economic integration, sharing economy, e-commerce, online electronic services and electronic games like Uber, Grab, online service and online marketing. These are “gold mines” to expand the tax base. The direction of the Government advocates expanding the tax base in combination with adjusting tax rates according to the appropriate roadmap and leaving no impact on the process of accelerating socioeconomic development. The sector will review existing tax policies, compare them with provisions of the Organisation for Economic Cooperation and Development (OECD), the United Nations (UN) and the United Nations Development Programme (UNDP) to supplement, amend and make them compatible with international regulations to minimise acts of transfer pricing that gives rise to losses to the State Budget. The sector will quickly apply electronic invoices in the economy and encourage cashless payment. Electronic applications will be deployed to all scopes of operation, such as electronic tax code grant, car registration procedures and housing procedures. Electronic inspection will also be applied. Citizens and enterprises must be able to enjoy more from the process of progressive tax administration which is being headed towards the level of OECD countries, not just the ASEAN standards. All plans and solutions are hoped to make 2018 a boom year of economic indicators, including budget targets.